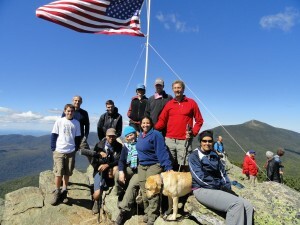 Tags: 2020VQ, blind hiker, Hiking, Quinn, Randy, success, Team 2020. 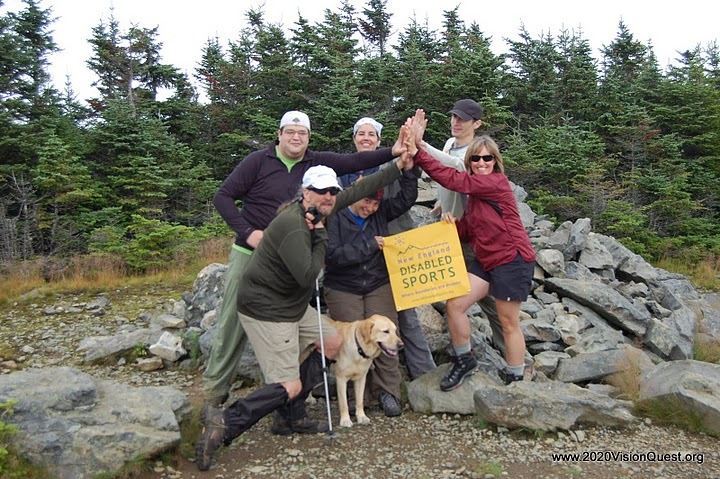 Team 2020 doing a virtual High 5 to their fans at the summit of Hale. As I settle into the electronic world to share our excursion details, I’m tremendously buoyed by the feeling of full accomplishment. This was our second official hike for 2020 Vision Quest, and while Washington was a great and successful experience, it was not a full success – as we “only” completed the impressive ascent of the mountain. This time, we conquered both the up and the down and can now name Hale as our first officially-completed peak in our quest for the 48. Sunday morning looked ominous. Tracy reported to me that our drive through Franconia Notch was enshrouded in storm clouds, and the pelting rain on the roof had me concerned. We reached the Zealand Road trailhead early as intermittent rain fell on a less-overcast sky. I reviewed the trail description one final time and – just as the rain tapered off – we heard the sounds of several cars approaching. It is amazing how our isolation, alone in early-morning quiet at the trailhead, transformed into a high-energy group laden with anticipatory excitement. 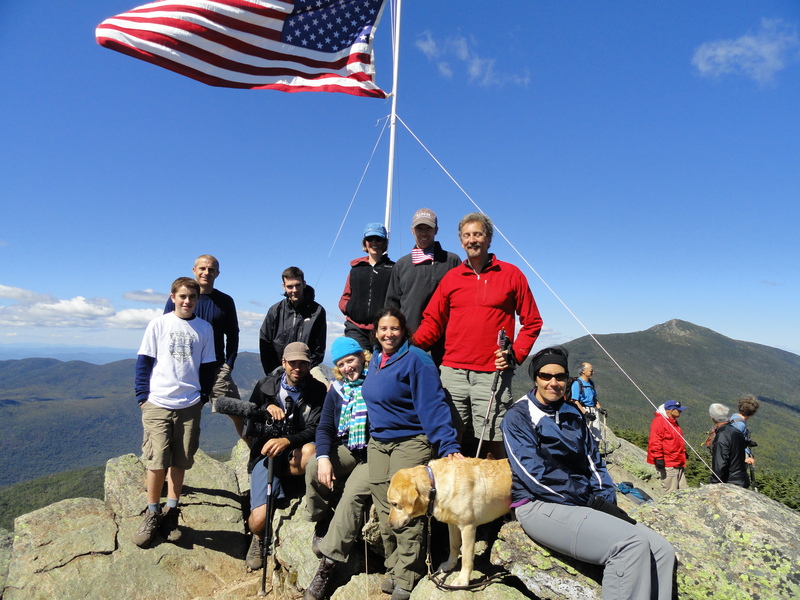 This experience, like most hikes, was likely to change and strengthen our friendships. It is precisely this transition and community bonding that I particularly enjoy. The trail offers plenty of time for introspective personal growth, and an equal measure of understanding the social growth and dynamics of the people with whom I’m fortunate to share the experience. We headed up the trail, and I quickly found that it suited my hiking style well. Quinn’s guidance was inspired, and at our first short break, there were some jovial complaints about the speed of my pace. Kevin even quipped that I was a “Hiking Shark,” having lured him in with talk of being a slow hiker. There were certainly challenges to slow me down, though the better understanding of them I’ve been gaining over the past few hikes, and the steady improvements Quinn has made, led to overall quick and strong hiking. Randy & Tracy at the summit of Mt. Hale. There were some tremendous birch trees along the route, and I remembered that in 1903, much of this mountain and many surrounding mountainsides were ravaged by fire. Birch trees are among the earliest growths, so those great trees we encountered on the trail likely started growing in 1904; just over 100 years of age. The birch tree, which delivers the name White Mountains, is so young and yet so old. It’s one of many reflections I treasured along the hike. 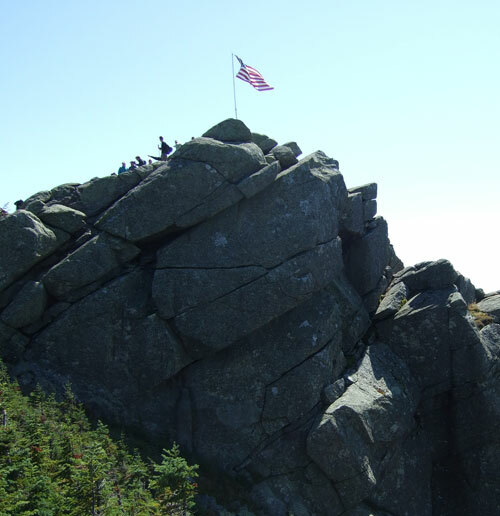 The summit transition was swift and redolent, from slight forest humidity to the open and wind-cooled, grassy peak. The summit was a great celebration as the overcast sky eased enough to give us ideal conditions to enjoy a lunch – not to mention the humor of having achieved this summit several hours faster than anticipated. 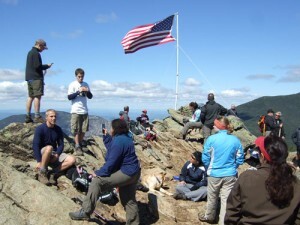 It gave us time to relax and enjoy our accomplishment as a group, knowing we had eradicated our challenge of time to summit. We took many photographs, told a few stories, and shared some time with other infrequent visitors to our mountaintop. We had the luxury of spending an hour together in such fine spirits before stretching well-worked muscles and returning down the Hale Brook Trail. 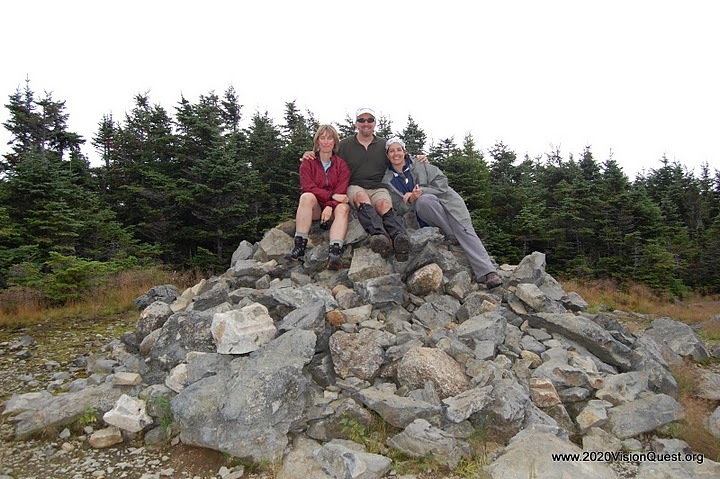 Jenifer (Hale hike leader), Randy, and K atop the cairn on Mt. Hale. The descent was slower but not tremendously so. The section of trail that is very narrow with a perilous drop off was challenging, since this time the drop was on my right, which meant Quinn could not shield me from it with his body. 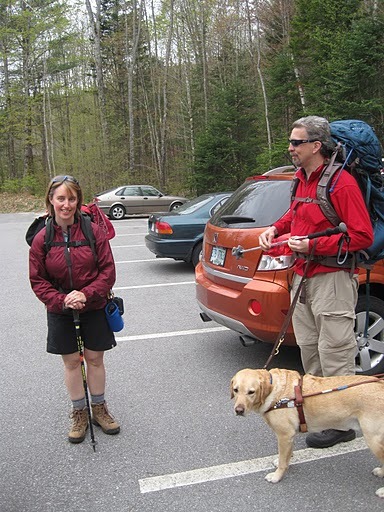 Quinn, as a guide dog, is always on my left side and my use of the Trekker Pole on my right side was mostly impossible due to the steep edge. Quinn was very cautious, and we took our time to navigate the slippery surfaces of wet rock and root, which were less challenging when climbing up. While climbing down, I recollected considerable portions of the trail, such that predicting the switchbacks and first stream crossings gave me real familiarity with my terrain and my journey. This comforting knowledge helped inspire me through each section and gave me the mental freedom to converse more than many other hikes would allow. By the final stretch, where we were at full speed again, I could not help but appreciate how complete and successful an experience we had enjoyed on this mountain. Hale is our first official success in the quest for the 48. I successfully climbed several others before launching 2020 Vision Quest, but this was the project’s first full success. I will savor the accomplishment, along with the companionship of the people who shared the journey with me. There will be many more mountains and many variations of Team 2020 ahead. I look forward to all of them, for each trip is distinctive in the challenge and reward. I will, however, fondly recall this group and Mt. Hale as the first of them all. Tags: 2020VQ, blind hiker, Hiking, safety, success, Team 2020. 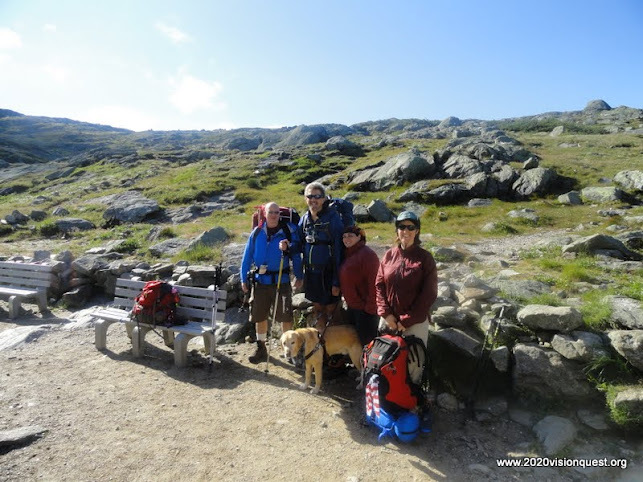 On Mount Washington, we learned some hard lessons about how slowly Team 2020 hikes. 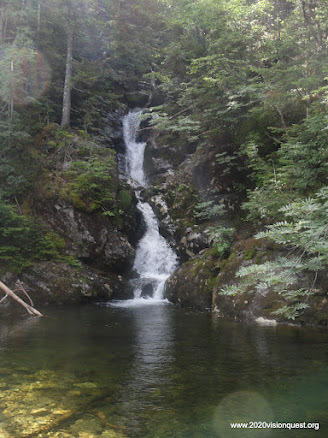 We knew already that we need to allow plenty of extra time for Randy and Quinn to work their way through difficult terrain, but the actual numbers that we put up on the Ammonoosuc Trail were a bit discouraging. We found ourselves losing time here, there, and everywhere. I’ll be leading our Mt. Hale hike this coming Sunday, and I want to share some of my thoughts on moving fast through the wilderness. Now, no one who’s hiked with me in the past – Mike, Karl, Dan, and all you others – will claim that I’m a speedy hiker! 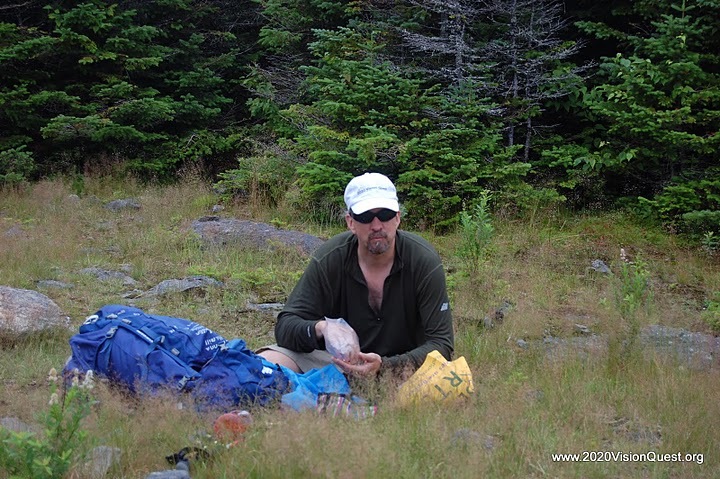 However, I’ve learned a few lessons over many years of hiking, climbing, and mountaineering. I’ve failed to summit mountains in about all the ways you can imagine, many of them time-related. First lesson: Both “slow and heavy” and “fast and light” travel are dangerous in their own ways. Find your happy medium. On the other hand, I’ve traveled “fast and light” too. In winter, I’ve been caught shorthanded when I needed certain equipment that I hadn’t brought with me! Also, warm-up hikes for 2020VQ have seen participants running out of water on long days, and that’s never good. 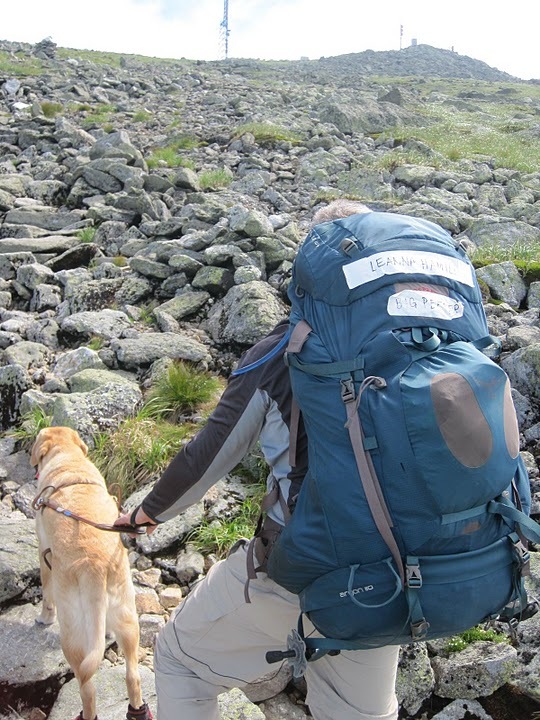 Fast hiking over rough terrain can cause injuries, too. 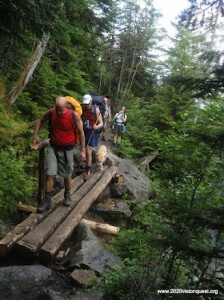 People trip and fall, and fatigued hikers make mistakes when they down climb. I tried to keep up with my long-legged trekking companions for two days of downhill in the Himalayas, and my knees hurt for years afterward… ouch! Move fast, but not too fast. Once you’re warmed up, get your body working at a level where you can still converse (between deep breaths), but where you can cover ground quickly and smoothly. Experience, fitness, and good technique help here. Everyone has a “sweet spot” – a speed at which they move most efficiently – and it’s okay for a varied group like 2020VQ to spread out a bit, up and down the trail. On Hale, the leader will go last, to make sure no one is left behind, and we’ll regroup as necessary. Minimize stop time. Sometimes we all need to rest, or eat, or pee, or adjust boots – but “short” group stops can easily stretch out into ten or fifteen minutes. That’s lost time, and lost momentum. Disciplined habits help here. Need to take your pack off? Do it as soon as you stop, finish what you need to do, and get the pack back on before the group gets ready to go. Can’t find something in your pack? Organize it carefully ahead of time, and memorize where everything goes. Need to “chase a rabbit” in the woods? Drop your pack and go; no need for a group stop. Randy and Quinn will need to stop at certain obstacles (e.g. stream crossings), and those are fine, but we don’t want to add to the total stop time with unnecessary stops. During the Mt. Hale hike, I want to work on shorter group stops, and I’ll be a stinker about it. Team 2020, you have been warned! Lighten your load. As I said above, a heavy pack is a safety risk. Go through your pack and see what everything weighs, if you’re curious. What can you honestly do without? Can you replace a critical piece of equipment (shell jacket, headlamp, etc.) with a lighter alternative? Can you reduce food weight by carrying dehydrated or dense foods, instead of water-heavy foods like fresh fruit? Of course, some things are necessary no matter what. Just before the Mt. Hale hike, I will see that certain items (Quinn’s gear, first-aid kit, etc.) are distributed fairly among participants, so that Randy, the most injury-prone of us all, gets a lighter load than he’s carried in the past. Stay fueled and stay cool. Thirst and low blood sugar make you ineffective in all kinds of ways, even before you notice it. I recommend never waiting until a stop to eat or drink, since it may be a while before the next convenient group stop. (Team 2020, we don’t really want to stop Randy and Quinn while they’re “in the zone,” right?) Make sure you have water and small amounts of food accessible to you while you walk, so you don’t even have to stop at all, let alone unpack. In the summer, keep cool to the extent you can. The mountain air is so much more invigorating when you’re not miserably hot! Which brings me to my last point: a hike shouldn’t be a death march. It’s supposed to be fun! If you’re working yourself to exhaustion, you won’t enjoy it so much. Think, plan, pack, learn the techniques and systems, and stay disciplined, but once you’re out there, smile and enjoy the beautiful surroundings! Washington is a mountain of many moods. You don’t know how the mountain will behave on the day you show up at the trailhead. What will the weather do? Will it be windy or calm, clear or foggy, snowy or rainy? What else will you see? What stories will you return with? I’ve lost count of how many times I’ve been on Mount Washington over the past twenty years. But I remember the stories. Here are some of the things that have happened to me up there. The dumb college student. I had just learned to ski, and one spring I tagged along with some much better skiers who were going to Tuckerman’s Ravine for some serious skiing. On the way up, the weather changed literally every few minutes: sunny, dark, snowing, whiteout, sunny again. 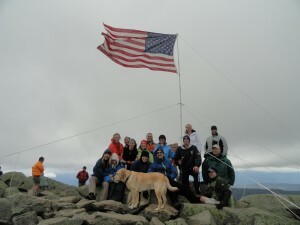 I made it as far as Hojo’s (a building near the base of Tuckerman’s) before I realized how woefully underdressed I was! After recovering from mild hypothermia, I attempted to ski back down. Actually, I would ski a few meters, slip and fall a farther distance, get up, repeat. As we drove home that evening, we looked up to see the summit of Washington, tauntingly clear against the darkening sky. “I’ll be back,” I said to the mountain. The blackflies. 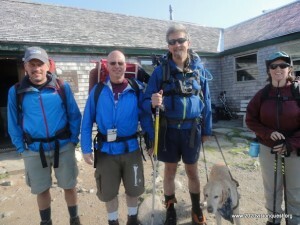 A group of us went up Boott Spur to Lakes of the Clouds one June. I hadn’t known that blackflies — soft-bodied, persistent, obnoxious, biting little things — were worst in June. They were terrible! At stops, they would cover our faces and necks. I got so fed up at one stop that I grabbed my pack, mumbled apologies to my hiking partners, and dashed up the trail, slapping and waving and yelling at the flies as I ran. (It actually worked for a few minutes.) Later that day, the rain and fog closed in, and the blackflies went away — they don’t like it any more than we do, I guess. The snake. When I was helping guide a group of blind hikers on the Old Jackson Road one summer, at least two of us saw a large, beautifully patterned snake slither across the trail a few yards ahead of us. On his tail was… a rattle. The sunset. The heaviest pack I ever carried was full of climbing gear and ropes, in addition to the stuff you have to take on a Washington day trip. We climbed a rock route in Huntington Ravine that day. The climb itself was fabulous, but the pack wore me out! I “hit the wall” at the top of the route. After redistributing the heavy gear, we each made our way slowly back along the Alpine Garden and down Lion Head. Thankfully, the mountain was in the best of moods that day. I stopped for a rest around sunset — still on the Alpine Garden — and realized that there was no wind, no clouds, and no sound except the croaking of a distant raven. The sun slanted down over my shoulder and cast blue shadows on the valley below. What an exquisite moment. Jenifer with Randy & Quinn before a *much* easier climb! The ice axe. On a winter ascent, we used full mountaineering gear and technique. Good thing, because as we ascended the summit cone, we were in a whiteout the whole way: vicious roaring wind, driving snow, zero visibility beyond a couple of yards in front of you. We made it to the summit in that! 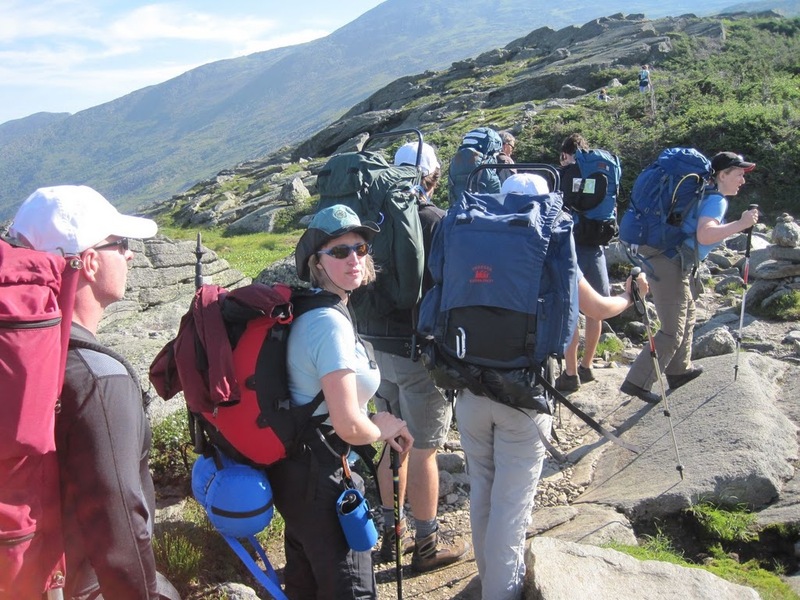 On the way down, the weather cleared rather suddenly, and at the lip of Tuckerman’s Ravine, it was decided that the group would slide down on our bottoms. (Yes, you can do this safely and under control.) The first few climbers started the slide with no problems. But when I went, I accidentally slipped out of the track they had laid, and I hit ice. 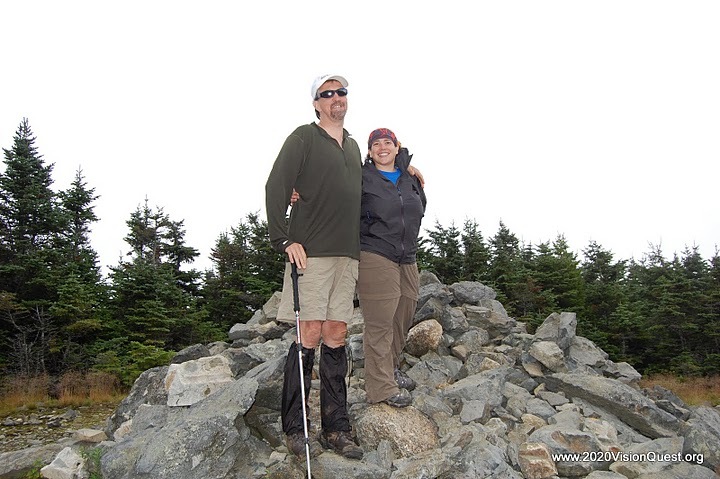 Next thing I knew, I was rocketing down Tuckerman’s Ravine — on my back, head first, no control at all! I honestly thought I was going to die. But the previous day, we had practiced self-arrest with ice axes. Good thing. I whacked my ice axe into the snow, the way I’d been taught, and stopped my slide before I reached the rocks at the bottom of the gully. The moon. 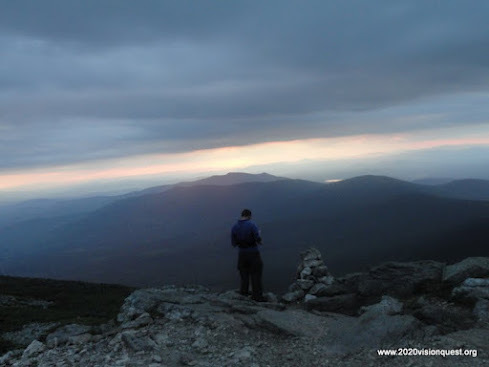 A few summers ago, some friends, a dog, and I climbed the same route that Team 2020 might climb this coming weekend — up the Ammonoosuc Ravine Trail, stop at the Lakes of the Clouds hut, climb to the summit, and down the Jewell Trail to complete the loop. It was a hot, dry, windy, beautiful day, and we had a ball! Now, the Jewell Trail descent takes you across the Cog Railway tracks. We happened to be in that area at the same time that a train was coming up the mountain. Leaving the dog with me and the other female hiker, every single male member of the group ran to the tracks and mooned the Cog Railway. Oh, the juvenile hilarity! There will be more stories from our trip this weekend. I hope they’re good ones. What stories do you have from this unique mountain? Share them in the comments!